Physical prizes can only be shipped to the United States, Canada, countries in the EU, and Australia/New Zealand. 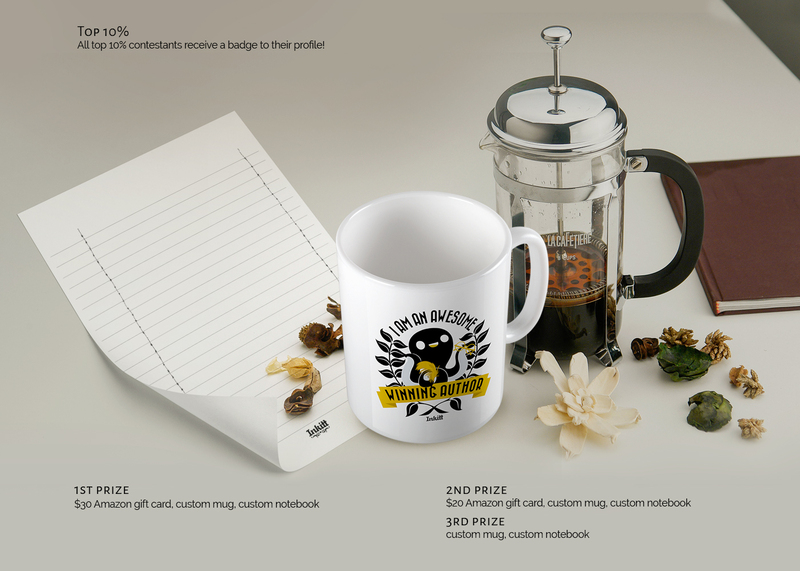 $20 Amazon gift card, Inkitt custom mug, Inkitt custom notebook. Inkitt custom mug, Inkitt custom notebook. All top 10% contestants receive a badge to their profile! Robin, a cyborg, lives in a world where they are treated as slaves. When a rebellion arises, she has to decide her place. She might also possibly fall in love along the way. If the law says you have no rights who's left to defend you? When the realities of what the law means hits home to Cross she is torn between doing her duty and doing the right thing. Whilst surveying the rings of Saturn, a survey craft is attacked and swallowed by a creature. Now trapped inside the beast the crew must make a decision to save their lives. Do they fly up or down? Sometimes a new reality is lurking right under the surface of what you know... Alia Cheveyo is a young Hopi woman who receives a visit from a stranger and embarks on a spiritual journey. It is 2052, and few remember the world before massive air pollution, global warming, and the near-extinction of natural water. James, a master thief on the frontier world of Zona Nox, is forced into the military as a mysterious alien empire threatens his home. In a world that has become completely devoted to technology, a movement has started to bring people back to traditional humanity where they think and decide for themselves. He had failed them and now he would never have another chance to free them. His people would have to fight for their own freedom now. The nine Sisters left Earth, fleeing a catastrophic virus. Terpsichore was once human, and now is the consciousness of a greatship. Can she overcome her fear, and complete the mission? As humans head out to the stars, they must beware of wolves. Earth is grossly overpopulated and mankind needs a solution to continue the human race. What are we willing to do to continue our way of life? Would we lie to ourselves? Jake witnesses the death of his uncle at the hands of Romalor Leximer, the leader of the planet Craton. While seeking revenge, Jake finds himself caught in a government conspiracy on Earth.